Reviving Biblical Wedding Customs in Preparation for the Third Temple - Breaking Israel News | Latest News. Biblical Perspective. Weddings in Biblical times were significantly different than they are today. One Jerusalemite, a simple tailor, has spent years and tens of thousands of dollars to recreate this joyous occasion as authentically traditional as possible. But there are still some changes that need to be made, which will have to wait until the Third Temple is built. The tailor, Reuven Prager, who specializes in Biblically styled clothing, has a passion for restoring ancient Israelite customs. Twenty-five years years ago, Prager learned about four marriage customs described in the Talmud as having fallen out of practice after the destruction of the Temple in 70 CE and the squashed Bar Kochba revolt in 132 CE. Prager wanted to revive those customs in order to pave the way for the Third Temple, but he also had a vested personal interest. “I met a really beautiful woman and I wanted to have it ready so I could propose to her,” Prager told Breaking Israel News. Prager found references that in ancient Jewish weddings, there was an ateret chatanim (groom’s crown), a golden crown worn by the bride, a unique type of wedding canopy (chuppah chatanim) and a luxurious palanquin that was used to carry the bride to the canopy. Until the destruction of the Second Temple, the groom’s crown was composed of roses and myrrh. 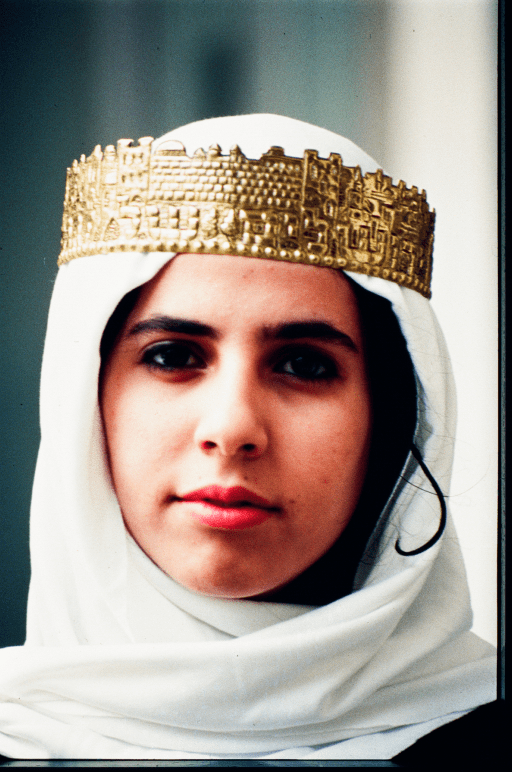 The kallah (bride) wore a crown of gold depicting the walls of Jerusalem. Jewish weddings today however, focus on the chuppah, a canopy made from a piece of cloth, frequently a tallit (four-cornered prayer shawl), that is suspended from four poles. Prager discovered that in ancient times, the chuppah chatanim was shaped like a dome. Prager found a reference to the aperion (palanquin) in the Song of Songs. After discovering these ancient customs, Prager performed exhaustive research on them. When he learned enough to actually recreate the items, Prager consulted with Rabbi Menachem Bornstein, an expert on the Temple era, who then directed him to an expert on Jewish laws pertaining to marriage practices, Rabbi Shlomo MinHahar, the late Sephardic Rabbi of Bayit Vegan, a neighborhood in southwest Jerusalem. Concerning the four ancient practices used in Jewish weddings, Rabbi MinHahar, ruled that the groom could not be crowned until the Temple is built. Similarly, the bride can only wear a crown which has an intrinsic value that is less than that of pure gold. The aperion and the domed canopy, however, are permitted before the rebuilding of the Temple. Prager commissioned a skilled goldsmith to create a bridal crown from an alloy of brass that when polished, appears exactly like solid gold. ”When the temple is built, we’ll replace it with a 14 karat gold crown,” Prager said with determination. Prager made chuppah chatanim from crimson silk decorated with fine beaten goldwork. He had four ornately carved wood poles made for suspending the chuppah chatanim. The aperion proved to be a far greater challenge, requiring nine-and-a-half years and $30,000 years to build. After the material arrived, Prager organized a group of women who were upholsterers, just as King Solomon wrote in the Song of Songs, to fashion the interior from purple velvet. 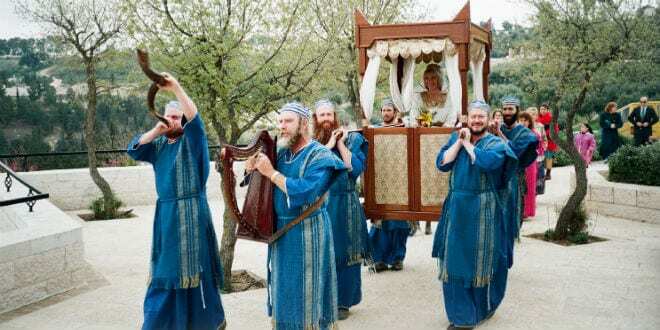 The aperion is carried to the canopy to the accompaniment of shofarot (ram horns) blown by Biblically garbed men. As Prager found out, many of the laws and customs concerning Jewish weddings are deeply connected to the Temple. As everyone who has attended a Jewish wedding recognizes that the groom breaks a glass at the end of the marriage ceremony, very often accompanied by a song from Psalms. The Talmud explains that this custom is in memory of the destruction of the Temple. Rabbi Avraham Arieh Trugman, director of the Ohr Chadash Torah Institute, believes there is an intrinsic connection between the Jewish Temple and marriage. “We see this in the cherubim, the angelic forms, that were upon the cover of the Holy Ark, in which one represents God and the other represents the People of Israel,” he continued.